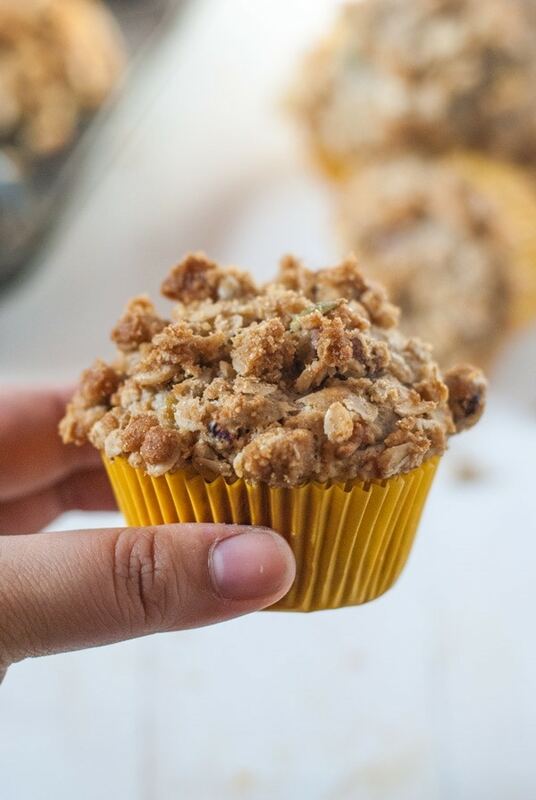 Banana muesli muffins with a muesli streusel topping are the perfect way to start any morning…even Mondays 😉 They are easy to make, full of flavor, and are a great guilt-free treat. When I was in college, I ate the same breakfast for about two years. A huge bowl of Tesco muesli – I always bought the 1 kg (2.2lbs) bag because it was so inexpensive, plus a slice of whole grain toast with butter and honey. Of course, I never bothered to look at the serving size of said muesli and probably ate about 600 calories of cereal every morning, but I loved it. Muesli was my jam. It still kind of is, but I rarely eat it anymore now that I know only a measly 1/4 cup is the average serving size for most muesli cereals. 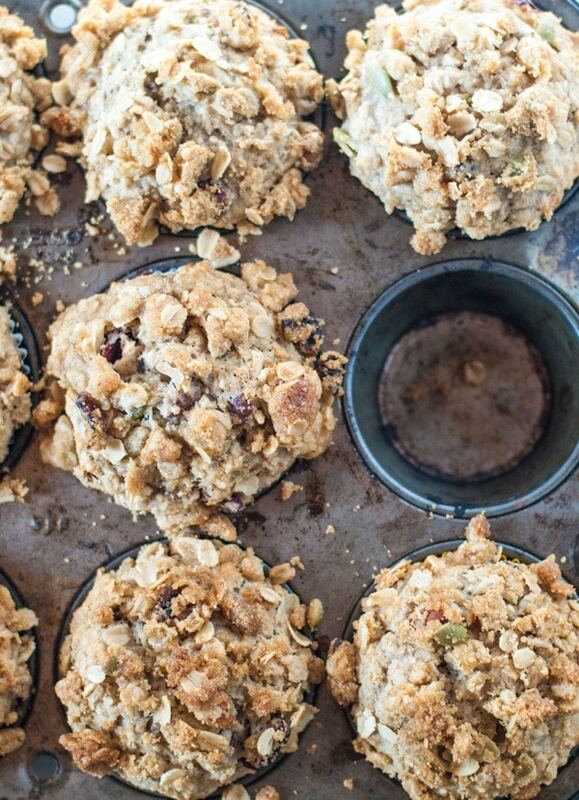 When I discovered that muesli muffins existed I freaked out. Seriously, freaked. out. I promptly bought two to eat on my way to class and as a snack on my way back home. It was a beautiful thing. Of course, it ended up having more calories than my bowl of cereal, but that was not the point. Besides, back then I was young and walked everywhere, so I burned calories like a champ. Gosh, I really miss those days. Now even thinking about about eating the way I did back then makes my hips double in size. And you see that pan up there? You may think I bought that somewhere so I can use it in my pictures and look all cool, but no. That is actually my muffin pan that I use. It’s as old as I am and been through twice as much as me through the years, but I love it. Always use a liner when I use it though. Always. I decided I needed to make my own muesli muffins because I’ve been all nostalgic, but wanted to cut down on the calories a bit. So, I made my own faux-museli and put it in a fluffy banana muffin. Then I topped with in a muesli streusel topping because I love that crunch with the nutty/fruity flavor combo. Thus, the banana muesli muffins were born. Can I take a second break just to point out that I totally did a bit of photoshopping on my thumb there because the skin around my thumb is so bad right now after washing a million dishes and not moisturizing once. 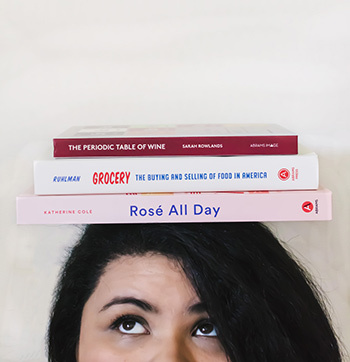 Maybe I shoulda photoshopped some nail polish too, and make it look like I actually take the time to make myself all purdy every day, which I totally don’t do. I mean come on, I am a single mom, what do you expect? I’ve got no one to impress these days. I actually spoke to Vlad the other day and was surprised at how composed and friendly I was. The only reason I spoke with him was because Natushka’s been asking a lot about him and I wanted her to get a chance to speak with him. It’s not that I’ve been purposefully keeping her away from him, but living with a 5 hour time difference and busy schedules, it can be difficult to find a time everyone is available and awake to speak. And… I also want himto try to make more of an effort instead of me doing all the work which never seems to happen. His sister is getting married the day after my birthday next year in Estonia, so we might see each other then. It’ll be my first time meeting his mom and sister and I am pretty excited because we’ve spoken to each other online and they are wonderful, kind women. I wish I living closer to them. I guess if I learn Russian or Estonian, I could move there with their help. Finding a job in Seattle’s been a huge pain as it is anyway. 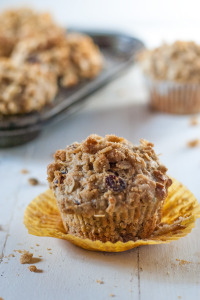 In the meantime, while I try and figure things out, I will enjoy a couple of these banana muesli muffins. Fun fact, there isn’t a whole ton of sugar or butter in these. 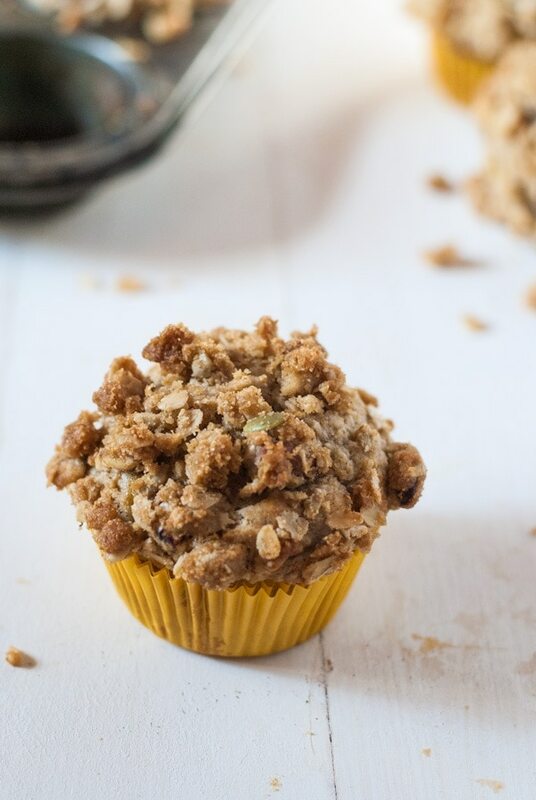 The streusel is the most unhealthy part of it and that’s because… it’s streusel. It’s a part of my oh-crap-I’ll-be-30-soon-and-my-metabolism-isn’t-what-it-used-to-be-so-I-better-eat-more-healthy-now “diet.” I say diet, but what I really mean is I drink a green smoothie and have one of these muffins in the morning to make myself feel better after having a slice a cake right after a quick jog before bed. 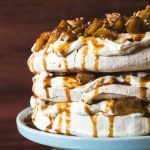 We get all our sweetness and moisture from roasted bananas, a bit of coconut oil, some light buttermilk (nonfat yogurt works, too!) and 1/3 cup sugar. 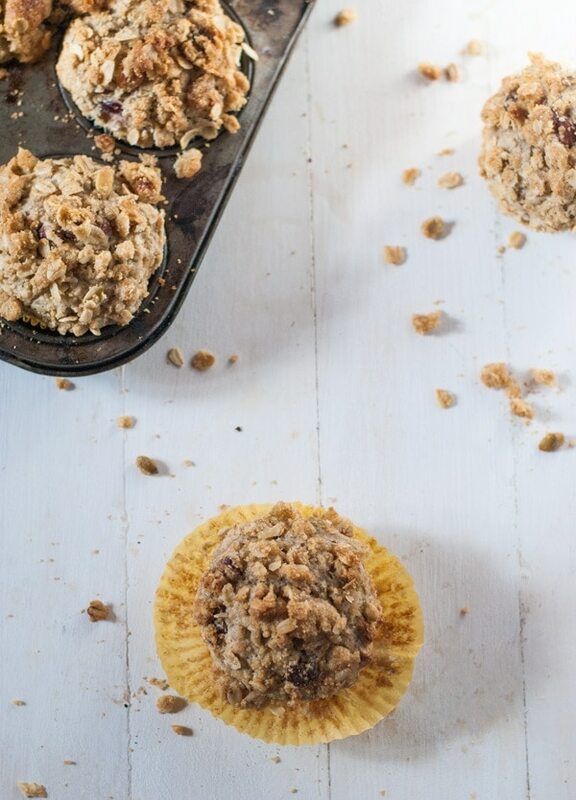 Oh, and we also add a bit of extra healthfulness by using some whole wheat flour, and adding some ground flax in the streusel. 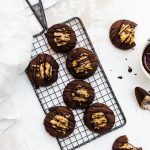 In the end, this is a sweet, healthy little muffin you don’t have to feel bad about eating that tastes almost like the full-fat versions we are used to. Almost. 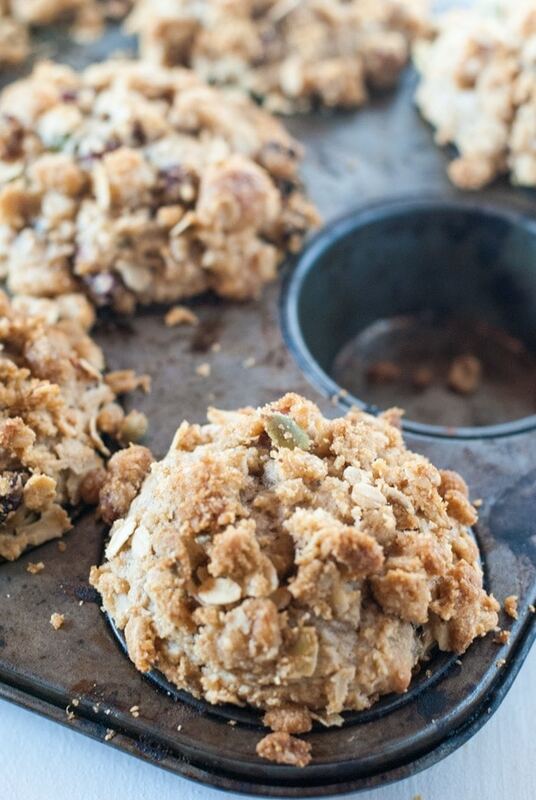 Don’t have time to whip up these delish muffins now? Pin it for later! 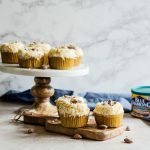 Banana muesli muffins with a muesli streusel topping are the perfect way to start any morning...even Mondays 😉 They are easy to make, full of flavor, and are a great guilt-free treat. Preheat the oven to 375 F and line a muffin tin with paper liners. Mix all the ingredients for the streusel together in a small bowl until well combined and varied crumb sizes form. Set aside. Mix together the buttermilk, egg, oil and roasted mashed bananas together in a bowl until well combined. Set aside. In another bowl, mix together the sugar, oat bran or ground oats, flours, seed & fruit mix, baking powder and baking soda together. Slowly mix the dry ingredients into the wet ingredients. Do not overmix, lumps are our friends. Use an ice cream scoop to fill a lined muffin pan with the batter (you want the pan to be pretty full, but not overflowing, 3/4 of the way full). Evenly sprinkle the muffins with the topping and gently press down so they stick to the batter. Bake for about 20 - 22 minutes, or until a golden brown and a toothpick inserted in the middle comes out with a couple of crumbs sticking to it. It took exactly 20 minutes for my muffins.